"Farms Under Threat," a new report from the American Farmland Trust, shows the dire state of our nation's farmlands. The organization’s findings, which they are calling “the most comprehensive ever undertaken of America’s agricultural lands,” aren’t hugely shocking, at least at the surface: American farmland is being vacuumed up by development. What’s new, though, is the discovery that the development isn’t coming only from urban areas expanding outwards – rural areas are also losing farmland rapidly. “The fact is that we have this sort of insidious development that no one’s been paying attention to, and we really need to start paying attention,” says Julia Freedgood, the assistant VP of programs at the AFT. Why is this happening? There’s no simple answer. One major reason, which has spiraling effects, is that farming is an incredibly difficult and not a very lucrative career path. The average age of the American farmer was nearly 60 in 2012 (the time of the last census); as those farmers retire or pass away, successive generations turn elsewhere for jobs, the land goes fallow and is sold off. Another reason: it’s sometimes simply worth more to sell farmland rather than actually farm the land, especially if that farmland is near a city or town. “There’s no one to take it over and it’s worth more selling to developers, so why not?” That’s also part of the reason it’s obscenely difficult to find new land for new farmers; land access, according to the National Young Farmers Coalition, is one of the most difficult obstacles for beginning farmers. This is concerning for a variety of reasons. The obvious one is that farmland produces food, so less farmland means the price of food may rise. The majority of American farmland is devoted to commodity crops – soy, corn, wheat – and many of the uses of those crops are not for direct eating. Much of it, though, is used for animal feed, and if the price of animal feed goes up, so goes the price of meat. And, of course, some of the farmland being lost is for so-called “specialty” crops, like fruits and vegetables. But there are other reasons as well. Development on farmland can have negative effects, removing land that animals use as a habitat. Well-operated farms care for the soil, air, and water, and produce viable ecosystems. Economically, the agricultural industry employs millions in all sorts of fields, from machinery to inputs to researchers to retailers to packagers. We put together a list of some of the AFT’s findings that should help to add some (scary) context. 10% of the world’s arable acres lie within the United States. Agriculture contributes $992 billion to the American economy each year. 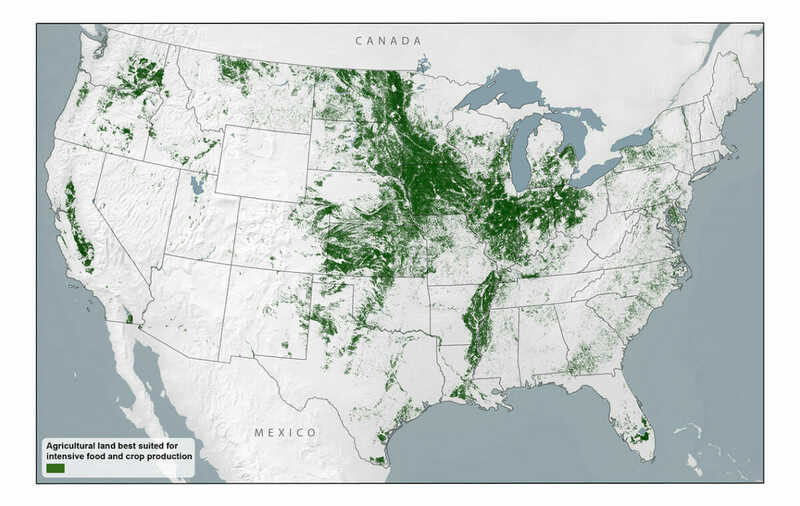 31 million acres of farmland lost to development, in total, between 1992 and 2012. That’s 175 acres per hour of agricultural land lost to development – 3 acres per minute. It probably comes as no surprise that the expansion of cities and suburbs are responsible for most of the loss in farmland. But 41% of the lost acres actually came from development in rural areas. The U.S. lost 11 million acres of America’s best agricultural land – land with superior soil conditions and weather for growing food – from 1992 to 2012. Best agricultural land for intensive food and crop production in 2012. Source: AFT, Farms Under Threat. 0.43 PVR: PVR stands for Productivity, Versatility, and Resiliency, and it’s a metric the American Farmland Trust uses to rate the quality of farmland. If farmland has a rating above that – say, 0.65 – that makes it great farmland. Below that, and it’s subpar. Farmland with a high rating is being lost disproportionately quickly, which means suboptimal farmland will have to be used. And suboptimal farmland requires more water, more transportation, more energy, more fertilizers, and more pesticides to be productive, all of which are bad for the environment. Just 17% of American land is ideal for farming. We don’t have that much to lose! The amount of the best land lost is about equal to California’s entire Central Valley. 62% of development between 1992 and 2012 took place on agricultural land. The other 38% was primarily forest and simply unused space. Some types of farmland are more at risk of being swallowed by development than others. 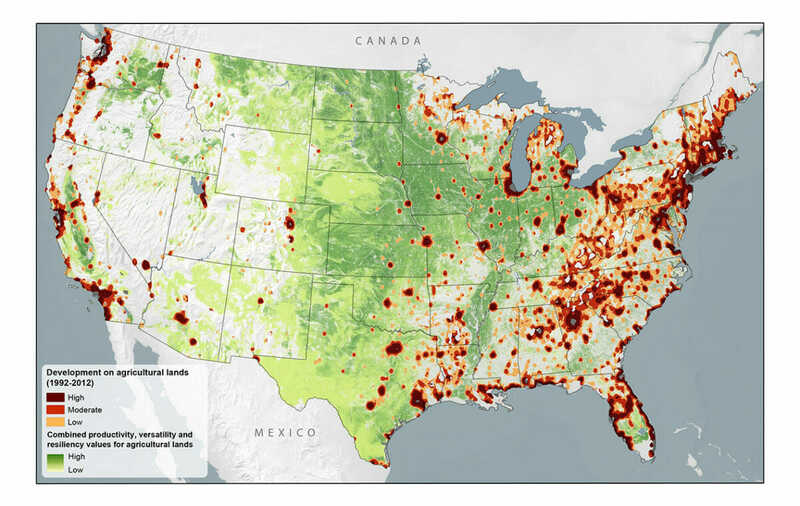 91% of the acreage devoted to fruit trees, tree nuts, and berries are directly in the path of development as they’re located in counties that qualify as either metropolitan areas or immediately adjacent to them. This report is the first part of a multi-year project to better understand farmland use and loss state-by-state, and to better understand the effectiveness of state farmland protection policies. Make sure to read the full, eye-opening “Farms Under Threat” report, and you can also use that link to sign up for updates on the project from the AFT. Wonderful article. I am a realtor. What can we do?